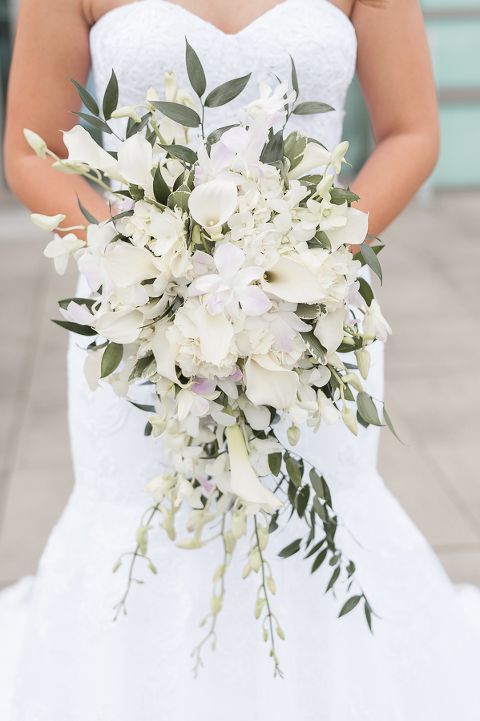 Elizabeth and Gustavo’s waterfront Tampa wedding featured a soft color palette of purple, ivory and silver. The bride and groom put an emphasis on ensuring that that every detail enhanced their elegant theme. “I incorporated my favorite types of flowers, which we used for the centerpieces and my favorite colors for the overall wedding theme,” the bride explained. 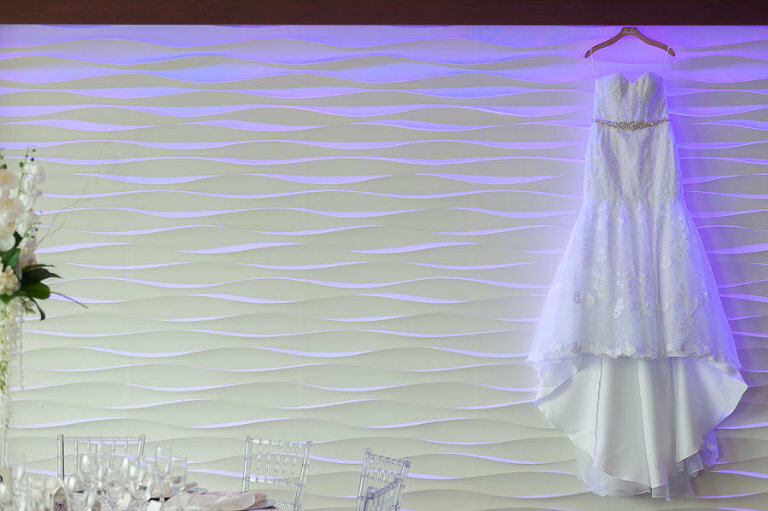 Searching for a waterfront ballroom with outdoor ceremony location that accented the couple’s elegant look, they selected the Westin Tampa Bay. With an emphasis on beautiful decor, the bride knew that finding a Tampa Bay event rental company that provided a professional and organized experience was of utmost importance. The bride hired Kate Ryan Linens and Rentals for their vast selection of items including clear chiavari chairs, glamorous charger plates and lavish linens. Lavender, white and silver. The combination of all three colors give off a very elegant look. I incorporated my favorite types of flowers, which we used for the centerpieces and my favorite colors for the overall wedding theme. We were walking my dog Tobi at Vinoy Park in downtown St. Pete, and we decided to take a little break and sit next to the water for a little while. Out of nowhere Gustavo secretly placed a purple bow (my favorite color) with the words “Will you marry me?” on Tobi’s harness. He then dropped down onto one knee and popped the question. Of course I said yes! We wanted the ballroom to have a very fancy, elegant look with a touch of color and beautiful Tampa Bay backdrops. 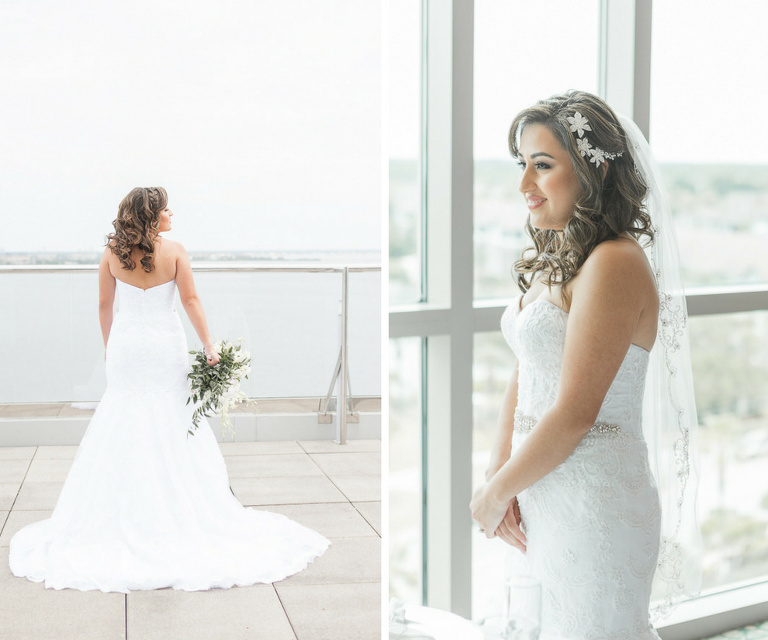 We chose The Westin of Tampa Bay for the incredible views from the ballroom. The service was amazing! Samantha Mann and her team did an outstanding job and delivered an amazing experience! Kate Ryan Linens and Rentals came highly recommend by our venue, and they did a marvelous job. Enjoy every moment. It all goes by so fast. 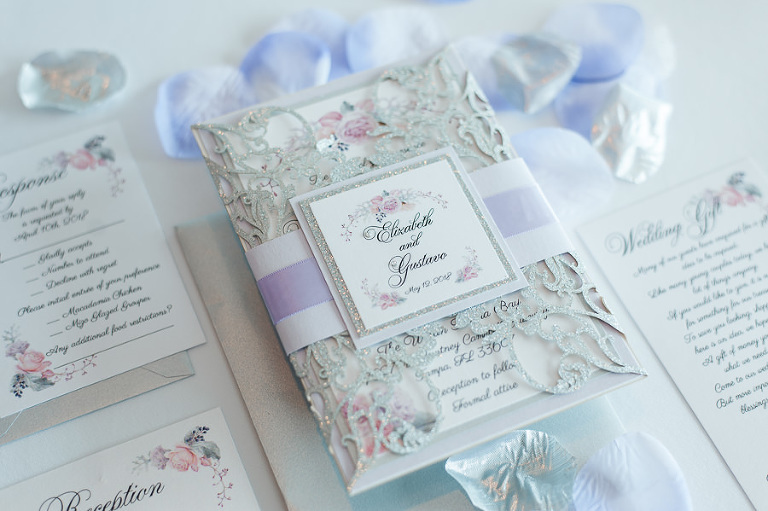 Invitations: Lili V the Company and Assoc Inc. Dress and Bridesmaid Dresses: David’s Bridal.